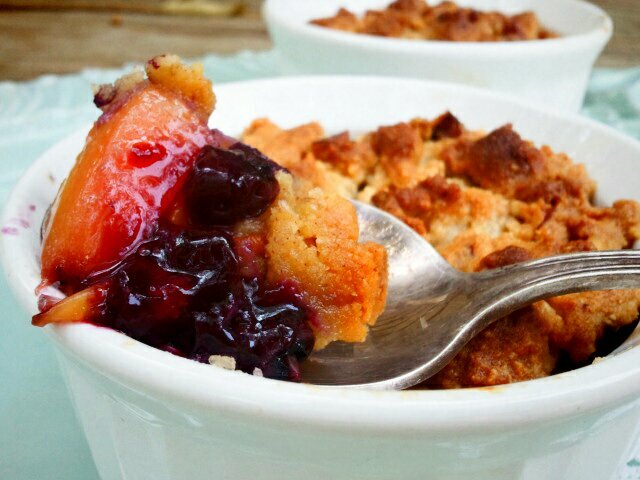 Crumbles are one of my favorite recipes to make year round using whatever fruit is in season. Summer time is full of fresh berries and delicious stone fruits! You could easily interchange any berry, or fruit depending on what is on your counter and ready to be used. I kept this recipe very simple, by not making a “filling”. The juice and sweetness from the fruit itself keeps the flavors of this dessert light, clean and crisp. 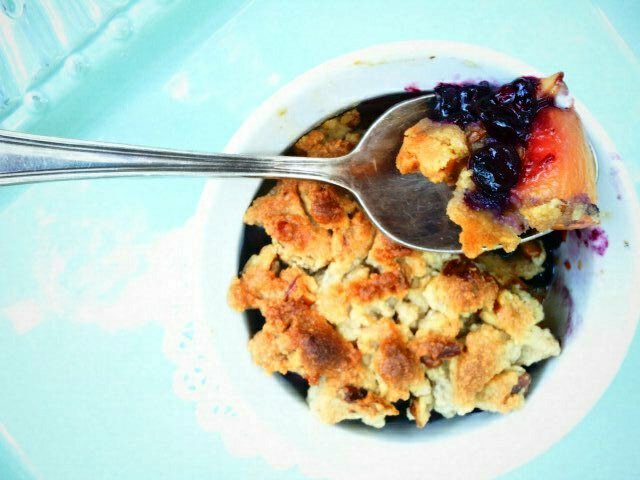 Divide your peaches and blueberries among your ramekins. Make your topping - combine the rest of your ingredients with a fork. Serve plain or topped with freshly whipped cream. *yields 6 individual servings or a two quart casserole dish. This is a recipe that I have made and modified MANY TIMES in the last couple months. The first time I made it just as in the recipe and I loved everything about it. My fiance is allergic to nuts and my son didn’t like the pecans so the next batch I made, I substituted “Bob’s Red Mill Gluten Free Baking Mix” for the almond flour and left out the pecans. I also used apples and raisins instead of peaches and blueberries because my boys are crazy for apples. The fiance literally ate the whole, and I mean THE WHOLE thing in one night. He stayed awake JUST to eat it hot out of the oven. I’ve also used Pamela’s baking mix for the topping, but that turns out more cake like. I have this recipe memorized and probably made about 5 of these in a month and a half. I prefer to use the almond flour listed in the recipe, personally but for those with nut allergies, just know that this is a VERY versatile recipe you should never loose. Thank you Michelle for yet another sweet concoction that I don’t feel guilty eating or serving to my kid! You do an awesome job of supplying the GF world with such yummy, NORMAL recipes, Michelle ~ THANK YOU!